Big Potential effect on travel for us locally. Anyone wanting to travel North -South is going to meet with a problem over access to the Bridges at various times. LOCALS ARE ADVISED TO TAKE UTILITY BILLS to SHOW THEIR LOCAL WHEREABOUTS and perhaps WHY they NEED to GET BACK. There will be a large scale security operation in place in place from 7am with the closures and searches of the bridges. Large areas of Central London from Chelsea through to Tower Bridge will be affected during the day. Albert, Lambeth, Westminster, Jubilee (Hungerford), Blackfriars, Millennium and Tower. Vauxhall, Waterloo, Southwark and London. 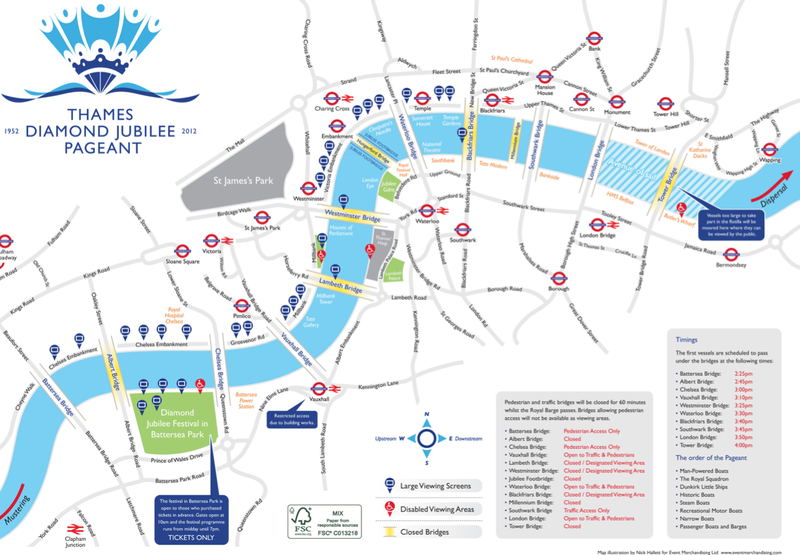 It is expected that Central London will be busy with 1000 boats on the river and the opportunity to see this once in a lifetime event. A number of premises overlooking the river have already identified that they are holding events. They will need to consider access routes to their buildings.